February is a busy month here at the studio – our summer schedule is out today (!!!) and priority registration for our families is open now. February is the month where we get all of the recital details (which classes are in each show, photo and dress rehearsal schedules, show orders, etc) out and published, and we really start making big progress on recital choreography in class! The rest of the school year will fly by before we realize it – and we are so excited to produce our biggest and best recital yet and see every single student showcase their growth and progress on the Paramount stage. 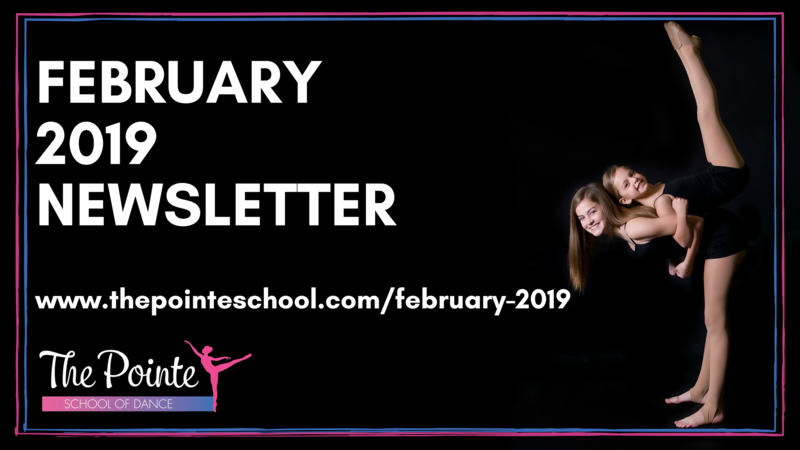 This newsletter contains links to our summer classes, camps, and intensives plus details on important dates for the rest of the year! Summer 2019 at The Pointe! This summer is set up to be the BEST one yet. We have camps, classes, clinics, and intensives set up to have lots of opportunities for dancing fun for dancers of all ages and experience levels – and priority registration for our families is open NOW through February 5. Registration opens to the public on February 5. Check out everything we have set up for summer online here! New PSD Apparel Store is Online Now! Stay Tuned for Recital Details this month! Our Photo Week and Dress Rehearsal schedules, Father-Daughter dance information, and the show assignments and show orders will come home this month. We will create a unique and special website for our families with practice videos, music, and all of the resources you need to be ready for Recital 2019. We produce 3 complete recitals on June 9 at the Paramount Theatre – at 1:00, 4:00, and 7:00. We’re working on the details over the next few weeks and will begin to send home these important schedules and information soon! 🙂 Some recital costumes have also started to arrive and we will begin sending those home with classes later this month as well. Dance Pathways Meetings at The Pointe – Mark Your Calendars! We are so excited to offer brand new open Dance Pathways meetings this spring! We know that as our studio grows, so do the opportunities for our students – and it can be a little overwhelming to see all of the options. We’ve scheduled meetings to open up our studio to answer questions to help families find the best mix of dance classes and activities to help their dancer achieve their goals. For more information and to RSVP or share these meetings, please follow the links to Facebook events for each meeting! The Pointe now offers Birthday Parties! Dancers with excellent attendance progress faster through the curriculum and perform more confidently throughout the season. We know sometimes illnesses or conflicts come up, and have a generous makeup policy. If your dancer needs to miss their class, we appreciate a heads up (email is best) so our teachers can plan accordingly if they have several dancers out one week for a school concert and dancers are invited to make up any class they miss by simply attending another class at the same level or one level below theirs within two weeks of the absence. There’s no need to ask the office beforehand – just come to the class and let the instructor know you’re there for a makeup While it’s ideal to make up a ballet class missed with a ballet class, any genre the dancer participates in will work for make up classes. We will make our decision about morning classes by 8 AM and afternoon/evening classes by 2 PM. If we need to cancel, we will let families know by emailing the classes on that day and posting in our private Facebook group (if you haven’t joined yet, please click here to request membership). If we must cancel a class due to weather, we do not schedule additional makeups – we encourage families to attend an alternate class as a makeup. If it is snowy and we don’t cancel, we don’t want to clutter up your email – classes are on as planned unless you hear from us by 8 AM for morning classes and 2 PM for afternoon and evening classes. Thank you again for your support of our studio and community. We are having a great year, and are so thankful that you’re a part of it!